Preparing an appropriate estate plan is important for any person of any age. The term "estate planning" refers to the creation of Wills, Trusts and other documents that control the distribution of your assets upon death or incapacity, including the selection of loved ones who will be responsible for overseeing that your assets are distributed in accordance with your wishes. In order to avoid lengthy court proceedings in the probate courts and ease the burden on grieving loved ones, everyone – regardless of their net worth – should have an individualized estate plan. Additionally, an estate plan should be updated every five to seven years, or following any major life event, to ensure that your plan comports with your particular wishes and goals as circumstances change and as the law evolves. The purpose of a Will is to set forth who is entitled to your assets after death; who will be responsible for distributing those assets; and who will care for your minor children, if any. 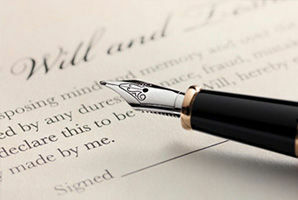 Without a Will, the above questions are determined by Illinois law in the probate courts. The probate process for intestate estates (that is, estates without a Will) is extremely time-consuming and causes inconvenience and hardship to all of those involved. Although Wills must pass through Probate as well in most cases, the preparation of even a simple Will can make life much easier for your loved ones and can ensure that your property is distributed according to your wishes. Also known as “inter vivos” trusts, these have become the cornerstone of most estate plans due to their flexibility and ability to completely avoid the probate process. A living trust is simply a document in which you (the “grantor”) transfer your property to a "trustee" for the benefit of others (the “beneficiaries”). Most frequently, the initial trustee and initial beneficiary is the same person as the grantor - you. Upon the death of the grantor, the Trust Agreement will determine how property is controlled or divided up without the involvement of the probate court. Death is not the only catastrophe that can wreak havoc on the lives of you and your loved ones. In the event that you become incapacitated, Powers of Attorney give the person of your choice responsibility for making your health care and financial decisions. They clarify your wishes for loved ones and settle disputes before they arise, and are an essential component of any estate plan. There are other, more advanced estate planning tools available for more complex estates which you may want to consider, including Gift Trusts, Family Limited Partnerships, Qualified Personal Residence Trusts (QPRT’s), and others. Additionally, it is imperative that physicians and others in high-liability careers safeguard their assets appropriately to ensure that these assets are protected from future litigation claims or other creditors. Contact Mr. Hess today to discuss which estate planning tools are appropriate for your situation. Hess Law Firm charges a flat fee for the creation of most estate plans. The fee may vary depending upon the complexity of the desired plan, but there will never be any surprises. Once presented with the documents that comprise of your estate plan, you will be entitled to one set of revisions free of charge before execution. Additionally, Mr. Hess will continue to keep you updated on changes in the law which may affect your estate plan even after your plan has been finalized. Mr. Hess does not believe that the attorney-client relationship ends once a particular job is done. He believes that once you are a client, you are always a client.